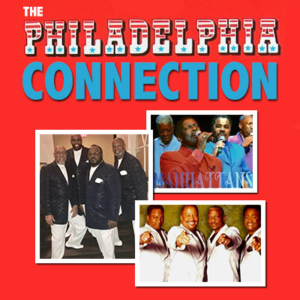 Titan Productions presents The Philadelphia Connection, a soulful journey back to the late 60’s into the 70’s with such iconic acts as the Manhattans, The stylistics and the BlueNotes. Soulful R&B artists fill the theatre with love and energy, reminiscent of the original groups. Previously known as Harold Melvin and the Blue Notes, featuring Teddy Pendergrass, The Blue Notes were formed over forty years ago in Philadelphia, PA. As one of the most dynamic groups that grew from the Gamble and Huff Sound, The Philadelphia Family, they succeeded in their goal to reach the highest of heights in the world of music. They have performed at Carnegie Hall, The Forum, Hollywood Bowl, Caesar’s Palace in Las Vegas, the Palladium in London and last year at the Wachovia Center in Philadelphia. Their vocal talents and choreographic genius have always marked them “specialists” in the trade. Among their credits, they have recordings of singles and albums that have reached Gold and Platinum status; “If You Don’t Know Me By Now” was nominated for a Grammy Award, “The Love I Lost”, “Bad Luck”, “Wake Up Everybody”, the list of hits becomes endless. Through the inspiration of the late Larry Brown and Bernie Wilson, the group added extremely talented gentlemen by the names of Arthur “Sugar Bear” Aiken,Ramon Bentley, Sonny King and Frank E. Lee. There are no adjectives to describe their grand performances; we will simply state that they have been performing to standing room only audiences for years, with a spellbinding, soul-stirring performance. The Stylistics was formed in Philadelphia, PA in 1966 from two groups, “The Percussions” and “The Monarchs”. When members from each group were drafted or went on to further their education, the remaining members under the guidance of their English teacher Beverly Hamilton joined forces and changed the name to “The Stylistics”. Their first song “You’re a Big Girl Now” was recorded at Virtue Recording Studio, a local studio in Philadelphia, which became a hit single for the band making it to number 7 on the Billboard R&B chart in 1971. After that success, they naturally followed up with an album release. Hit veteran producer Tom Bell was contacted and was hired to produce the group’s first album. The album featured the hits, “Stop, Look, Listen to your Heart”, “You Are Everything” and “Betcha By Golly Wow”. The success of the first album was phenomenal for that time along with an unheard release of six singles in total. The Manhattans are an American Rhythm and blues vocal group from Jersey City, New Jersey who came together after serving the armed forces. The Manhattans were formed in 1962 and in 1964 the group released their first single entitled “For the Very First Time,”. By 1968 the group received “Most Promising Group” award by NATRA and the following year they signed with De Luxe Record Label. Throughout the 1970s the group continued to record and release new music. Their song “Kiss and Say Goodbye” became their second single to go platinum in 1976.